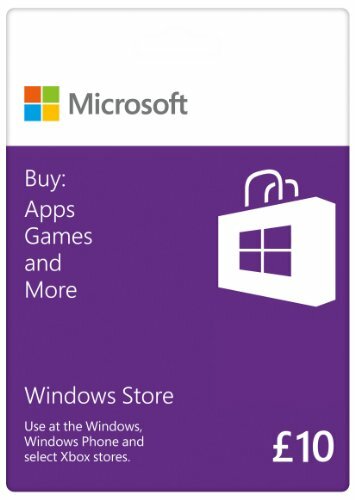 With a Windows Store gift card, you can buy and download thousands of amazing apps, games, and more at the Windows and Windows Phone stores. It’s a great gift option for friends and family and the perfect choice as an allowance or the occasional gift for your kids. Please be sure to keep your code to redeem. safely and securely from over 400,000 participating employers and financial institutions.On your Windows 8.1 PC or tablet: On Start screen tap Store. Swipe from top or right-click, tap “Your account” and enter code.On your Windows Phone 8: Launch Wallet app from app list and tap + button. Select Microsoft gift card and enter code. Not redeemable on earlier versions of Windows and Windows Phone. Windows 8 users: Update to Windows 8.1 for free through the Windows Store. The full code value will be applied to your Microsoft account and may be used for eligible purchases (exclusions apply) made directly at select Microsoft online stores. Geography limitations and balance restrictions apply. Eligible purchases and prices may vary by region, device, and over time. NO EXPIRATION DATE OR SERVICE FEES. Taxes may apply. Internet access (connect time charges may apply) and a UK Microsoft account are required. To create a new account, visit https://commerce.microsoft.com. Xbox Live required to redeem on console. Original Xbox excluded. Paid subscriptions required for some content. You must be 13+. Except as required by law, codes cannot be redeemed or exchanged for cash and are not reloadable or refundable. Microsoft is not responsible if your code is lost, stolen, destroyed, or used without permission. Subject to full terms and conditions and country restrictions at www.microsoft.com/en-GB/giftcard which may change without notice. Void where prohibited or restricted by law. Codes issued by and Microsoft Corp., a Washington Corporation, and/or its affiliates. Microsoft Corporation, One Microsoft Way, Redmond, WA 98052-6399 USA.